PHILADELPHIA: Andres Guardado became the first player to score in three Gold Cup finals and Mexico also capitalized on two defensive blunders to defeat Jamaica 3-1 and hoist a record seventh trophy. Guardado was followed in scoring by teammatesJesus Corona and Oribe Peralta in the second half while substitute Darren Mattocks pulled one back late for Jamaica. But the “Reggae Boyz” could not stop the Mexicans from capturing their third title in the past four attempts at the biennial North American regional football tournament. “El Tricolores” were powered by the Gold Cup’s most productive attack and humbled a Jamaican side that had been the event’s top defenders, surrendering only three goals in five prior matches. Mexico captain Guardado opened the scoring in the 31st minute, taking a perfect Paul Aguilar pass from the right wing that soared over the penalty area and onto Guardado’s left foot. The PSV Eindhoven striker finished by slamming the volley into the back of the net. Guardado, who has 10 career Gold Cup goals, also found the net in Mexico’s 2-1 loss to the United States in 2007 — the only Mexican loss in eight finals appearances — and again in Mexico’s 4-2 title win over the Americans in 2011. Corona gave Mexico a 2-0 lead in the second minute of the second half, stealing the ball from “Reggae Boyz” defender Michael Hector in the heart of the Jamaican half, racing to the top of the penalty area and left-footing a shot between defender Wes Morgan’s legs and inside the far post. 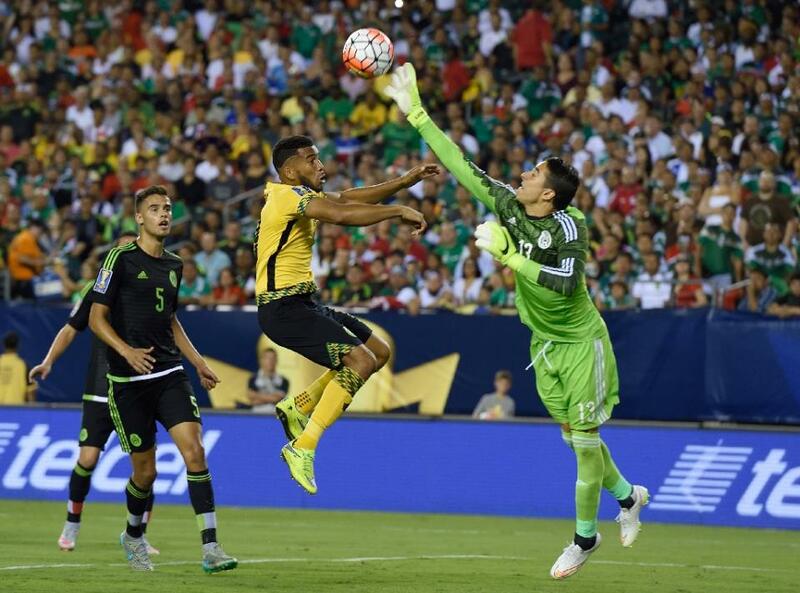 Peralta put Mexico ahead 3-0 in the 61st minute after Hector flubbed a clearing attempt on an Aguilar centering pass. The ball squirted to Peralta’s feet and he blasted it past Jamaican goalkeeper Ryan Thompson from point-blank range, delighting a majority of the 68,930 spectators at the home stadium of the NFL Philadelphia Eagles. Mattocks allowed Jamaica to avoid a shutout with a counter-attack goal in the 80th minute but it was too little and too late to stop a Mexican celebration at the final whistle. Jamaica settled for a runner-up finish after becoming the first Caribbean squad to reach the Gold Cup final, thanks to a 2-1 upset of the United States in the semi-finals. The best prior “Reggae Boyz” showing was a share of third in 1993.